Xiaomi has announced that it will unveil the second-generation version of its nearly bezel-free Mi MIX smartphone on September 11, just one day ahead of Apple's expected "iPhone 8" launch event in California. 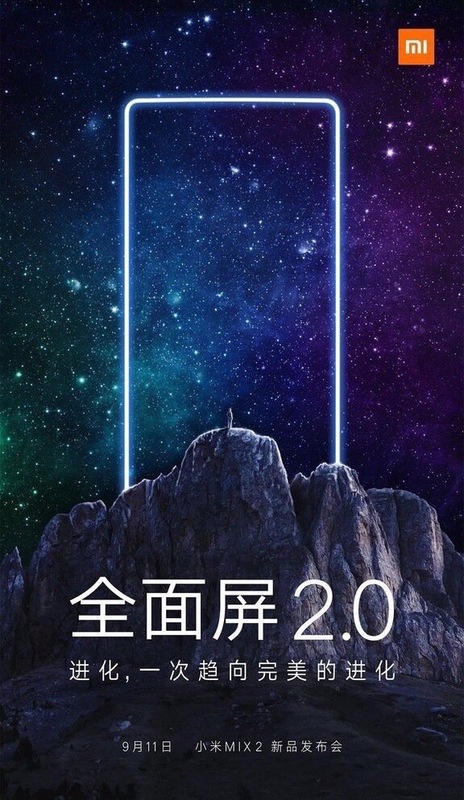 The Chinese mobile maker confirmed rumors of its event in Beijing next month by sharing a launch poster over microblogging site Weibo featuring a profile of the "full screen" Mi MIX 2 and the accompanying phrase "Evolution, approach to final perfection". Xiaomi turned heads in October of last year when it unexpectedly announced the 6.4-inch Mi MIX, which it called "the world's first edgeless display" smartphone, just as iPhone 8 rumors were beginning to gain steam. The device was pooh-poohed by some as "vaporware" when Xiaomi described it as a "concept phone", but the company began shipping the Mi MIX in December in limited quantities and received some respectable reviews. Once again, French designer Philippe Starck is said to have worked with Xiaomi on the Mi MIX 2, which is expected to feature an even higher screen-to-body ratio than its predecessor, but will adopt a slightly smaller 6-inch display with an 18:9 (2:1) aspect ratio. Speculation suggests Xiaomi may choose a metal rather than ceramic chassis to make the handset easier to mass produce this time. Internally, the Mi MIX 2 is thought to include a Snapdragon 835 chipset, 6GB of RAM, 128GB of storage, and a 3,400mAh battery. Prices are expected to start at around $600, with a higher tier model featuring 8GB of RAM and 256GB of storage for around $750. Other China-based smartphone vendors rumored to be launching all-screen handsets to rival Apple's so-called "iPhone 8" include Huawei and Gionee, with others expected to follow suit. Apple will reveal its first iPhone with edge-to-edge OLED display alongside upgraded versions of its iPhone 7 and 7 Plus next month. I can't agree. My Mi4's build quality is definitely well above average. My girlfriend's Redmi Note 4 feels rock solid and looks like a high end phone with its matte metal back and a chamfered edge. What's funny is Xiaomi thinks they're being clever and that by doing this they will steal Apple's thunder. So why do Xiaomi (and other companies) think they’re being clever by announcing their phone soon before the iPhone? It’s extremely stupid as all the attention will be focused on the iPhone the next day. If they have a more impressive (looking) phone the best thing is to bring attention to it and not to say ‘we were first’. The downside of xiaomi phones are their build quality and "MIUI" which is a heavily skinned version of Android. MIUI isn't merely a skin, it's rather a full fledged OS based on Android. There's pretty much nothing left of the pure Android experience. MIUI looks much like iOS, it's very clean, very fast and simple. How so? From my readings, the Xiaomi Mi Mix has really nice hardware standards and at a cheaper price point. The reviews are fairly positive for the first Gen Mi Mix. I imagine the Mi Mix 2 will be just as good and improve even more when it releases. This is no threat to Apple. I am not saying every xiaomi phone have terrible build quality.